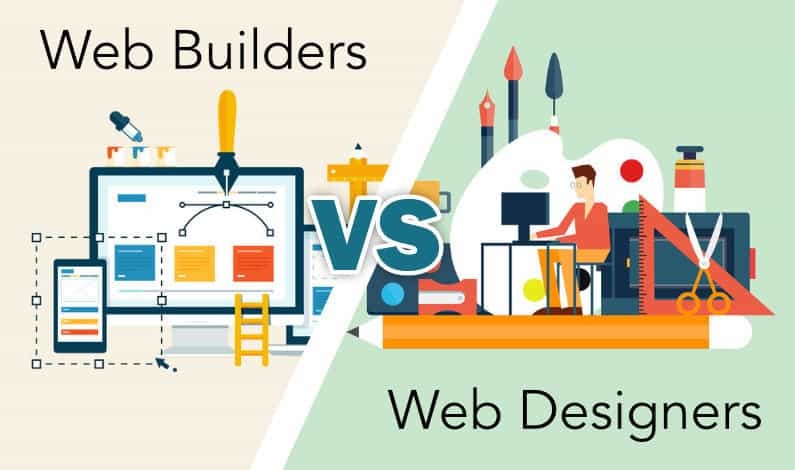 You’d probably expect a web design company to discredit do-it-yourself web builders as the inferior choice when it comes to choosing an avenue for your website project. But I think that web builders have their place. The question is, when is it a good idea to go with a web builder and when is it better to hire a web design company? What is a web builder? Just to catch you up to speed if you’ve not heard of web builders: they’re online tools that feature many different web design templates that you can edit yourself with visual controls. The idea is that you should be able to create a website yourself and cut out the web designer expense. For some businesses, there’s very little point in spending a huge amount of money on bespoke web design services when you’re just starting out until you know that your business plan is working, and you’re making decent sales. It’s rather a large risk to spend huge sums on a custom website, when you can get a basic website up together for very little cost using a web builder. When you’re starting out, web builder websites are great to provide background on your company, a means for people to get in touch, and even purchase your product or service. Most small startups really only need a web-builder to get going. Sites like Wix, Squarespace, 1and1, and Weebly among others can help you get a basic website off the ground very quickly, and it could look perfectly presentable and function exactly as you need it to for the early years of your business. What are the downsides of Web Builders? You’re limited by your own design skills. If you are careful, and you don’t go too crazy, you can alter a template in a subtle way and it will retain all of the design sensibility it was created with, and still look good after you’ve added your content. However if you go a bit nuts and rather overdo things, that’s when stuff starts looking out of control, doesn’t work correctly on different browsers and becomes a bit of a mess. There’s a learning curve involved. You might get to grips with things quite quickly, or it might take you a bit longer. Either way, you may find that your later pages are looking better than your earlier pages and you may have to go back and redo everything. It can take a long time to get a site looking the way you want when you’re using one of these platforms. Depending on the platform, you may find there are restrictions with functionality that mean you can’t accomplish what you’d like to through your website, such as ecommerce, complex forms, or a lack of expandability through plugins. Search engine optimisation is generally poor when it comes to web builders. Given that a website is largely useless if people can’t actually find it, this is quite an important one. With the best will in the world, it’s hard for a large company to give the kind of service a one-to-one professional can give. Web builders aren’t designed to be a consultative or relationship-based service. Customer service can be a sticky spot with web builders, whereas having a relationship with a web professional who can speak to you in plain English, understand your needs and offer relevant advice whilst taking care of all your backend and technical configuration is far superior to what you will get from a web builder platform. Web builders all use template designs that are available to all customers to use. This means the same designs can pop up time and again as there are often thousands of users on a platform. If you need something unique, it may be better to look for a designer. Beware creating your corporate identity through a web builder’s interface. Logo creation tools are fun and you may be able to create something presentable, but they’re not really a substitute for a professional’s skills that will incorporate knowledge of colour, fonts, white space, symmetry, balance and symbolism. Logos and brand identity are highly important to memorability, recognition, and trust. If you create a basic logo through a DIY logo creation tool and later realise that it’s inappropriate or ineffective and needs to be changed, that could have an adverse effect on your business. For logo design, we’d advise to start simple with a few key ideas that you can evolve rather than completely changing everything at a later date. Get your colours right, choose a font that is memorable and appropriate for your business and keep graphics and illustrations to a minimum. But even better, get a professional to do this part for you, because it’s too important to mess up! When should you choose a web designer? A (good) web design professional will create a website for you that matches with your brand identity, and is tailor made to appeal to your target audience. They’ll ensure the site loads quickly, has exactly the right layout and content, and the functionality you need to streamline your administrative tasks, take sales or bookings, and possibly provide SEO services to ensure your site can be found. A good web pro will also have knowledge of digital marketing, which is increasingly important to the success of an online business. Not all web designers charge a fortune. Services like Deluxe Web’s pay-monthly websites, as well as many freelancers may charge very reasonable rates for custom design work that allows you to concentrate on more important things whilst a professional handles your design requirements. The Deluxe Web service allows you to get a custom design for a low monthly fee with all the extendability that the WordPress platform offers. This is a pay as you go service that means if the business doesn’t work out for whatever reason, you’re not tied into a contract and you can just cancel. If your business requires specific functionality to get started that isn’t available through a DIY web builder, then you may have to invest in a web developer’s services to create it. This is inevitably more expensive and would be necessary for starting some online businesses. Some projects simply require a high level of design and development right from the start. Other simpler businesses may not. If you can afford to, it’s a good step to get your branding design done professionally to begin with, since it’s this that will give you recognition and inspire trust in your target audience. As I mentioned above, if you get this wrong, this is harder to change down the line, so it’s worth spending time making sure it’s done right. Firstly, we’d advise against hiring your brother-in-law to knock you something up. There are many folks with HTML/CSS knowledge, but it takes a lot more than that these days to make a successful website that can be found and converts! Some professionals will major in a particular area, whether it’s web design, branding design, web development, etc. Some will have a range of skills that incorporate all of these to a certain degree. It may make more sense to employ a freelancer who is an all-rounder rather than a single specialist – unless that specialist is VERY good at what they do and will make a huge difference to your project. Look for professionals or companies that have experience with the type of project you are starting. Check their portfolio or case studies and ask them about projects they’ve completed that might be similar to yours. You may have specific requirements in terms of software, programming languages, server technology etc for your project. Find a company or professional who can match up with this. Generally you will get what you pay for. If you need high-end design or a developer who can produce quality work quickly, then the price will probably reflect this. Some professionals charge by the hour, and some charge by the project. In our experience, each approach has its merits. A designer who works quickly and doesn’t make many mistakes may save you money by charging by the hour. Alternatively a fixed price protects you against unforeseen work, mistakes or changes in timescale. At Deluxe Web, we’ve been working in web design and development for over 15 years and we’ve seen a lot of approaches come and go in that time. Web templates have been knocking around for a decade and there are plenty of ways to get a cheap website, whether it’s using affordable talent or doing it yourself with a web template or web building platform. We recognise that startups don’t want to invest thousands of pounds in a website for a business that might not work out, but also that in today’s competitive marketplace, you need to stand out with creative imagery and an innovative approach. So how do you get the best of both worlds? Deluxe Web makes it easy for new or established businesses to get custom website design by experienced professionals. We’ve designed a range of packages with easy and affordable monthly payments, that aren’t bound by minimum term contracts or subject to set-up fees. Deluxe Web provides a perfect blend of the expertise you need to get a great looking website where all the technical aspects are taken care of for you, and keeping the cost down by providing state-of-the-art visual tools to allow you to easily update your website’s layout and content. Whether you’re just starting up in business or you’re ready to grow your established business to the next level, we make it easy and affordable. Check out our packages and get started with your project today. How can Deluxe Web offer custom web design afforadably? Our aim is not to erode the web design industry by offering bespoke web design at ridiculously low prices, but we recognise that professional custom website design is often outside the remit of many small businesses and non-profit organisations. Our service is based on streamlining the process of custom design by cutting down on the mockups, the back and forth, the design revisions, the meticulous planning of every text box and image. We start with one of our own beautiful and exclusive template designs and we modify it from there until it is unique to your business. We are confident that clients will stay with us because we provide an excellent service and an affordable way to pay. We also provide bespoke website design services with a traditional payment model, but if you’re on a budget and are looking for a way to get a professionally built website with all the benefits that brings over using a web builder, our pay monthly service could be for you. Find out more about our pay monthly service here.